At this point, the hardest artistic decision on Star Trek: Discovery to justify is the fact that it’s a prequel series. For all my criticisms of the show’s fast-and-loose approach to storytelling (which values gotcha moments and our assumptions of relationships over actual narrative build), I can at least get the appeal, and I’ve heard from a fair number of people who legitimately enjoy how DISC has been rocketing through plot points. Go down deep enough and opinion really is subjective, and while I would argue there are ways the writers could’ve made this approach more effective, I’ll readily admit that this is a style I’m inherently suspicious of. All of which is to say, we can at least have a discussion about how this show goes about its business without one of us stomping out of the room. But if you have a credible defense of why in the hell this is all happening before the start of the original series, I’m all ears. The more time goes by, the more nonsensical the decision becomes. The technology is too advanced; there have been too many plot developments that will need to be undone to make this all fit into continuity; and, maybe worst of all, literally nothing has been gained from any of this. I thought at first that the point was to bring us back to a time when the Klingons were still a threat, but Discovery has done such a thorough hatchet job on the species that I’d really rather they hadn’t. Apart from a few nominal signifiers, the writers seem to have as much interest in exploring Klingon psychology as they do in presenting us with a Federation near the start of its existence; to whit, none at all. Seriously, if you’re going to do a prequel you need to at least pretend like you’re trying to earn it, and Discovery hasn’t bothered. Watching “The War Without, The War Within,” I made an effort to forget when the hell this is all supposed to be taking place and just enjoy the nonsense on its own terms, and I had a fair amount of fun doing it. Once again, we appear to be watching a completely new series (of shows currently airing, only The Good Place rivals this one’s willingness to blow up a premise to move forward, and The Good Place—which is terrific—had the sense to build up its core cast of characters before going to Crazytown), but this at least finds us back in the “real” universe, with the Klingon War once again the main focus. Even better, the episode continues the trend of spending a considerable amount of time on the crew working together as a team for a larger goal. Sure, there are some secrets and a bit of drama, but the central story of the episode is all about assessing a problem—in this case, the Klingon dominance of the Federation—and finding a solution. Instead of half a dozen smaller plotlines struggling for attention, everything is pulled forward by the central concern. We even get a classic “triumph of science” moment when Stamets comes up with a plan to grow a bunch of spores at once. Burnham’s idea (which she gets with a little help from the former Emperor) to beam into the Klingon home world so the Federation can plan a massive coordinated attack to end the threat once and for all is loopy, but it’s the fun kind of loopy—a bold, optimistic plan that feels in keeping with everything else we’ve seen on the show this far. And hell, it even feels Star Trek-y, a risky piece of science that requires everyone involved to be at their absolute peak. Saru, in his infinite wisdom, lets Tyler wander around with the rest of the crew—he gets a bracelet that gives him “limited” freedom, but it’s still a bizarre situation, and it doesn’t become any less bizarre when he runs into Stamets in the hallway. If Tyler bears responsibility for Culber’s murder, shouldn’t he be in the brig? And if he doesn’t (which I’m assuming is the case, given the circumstances), what’s the point of forcing him to feel guilt for an action he had no control over? Maybe you can fudge this a bit; maybe you can blame the human part of Tyler for not seeking help when he knew something was wrong. That’s the tack Burnham tries when she finally confronts him, but even that seems misguided to me. There’s no clear precedent for any of this, and the attempt to force it into some sort of familiar arc—a sort have-cake-eat-too interpretation of betrayal that allows the writers to get the shocking twists without having to completely sacrifice a major character—makes for bumpy viewing. It doesn’t help that the big romance between Burnham and Tyler is still more a matter of plot convenience than actual connection. Still, Sonequa Martin sells the hell out of it; her performance here is so strong that it’s possible, at least for a moment, to put aside how strained all this is and just appreciate the feeling behind it. Too much of the show seems to have been written with the big moments plotted out in advance, but there’s just enough here that I find myself enjoying some of those big moments in spite of my misgivings. It’s still not really a coherent show yet, but at times it has enough swagger that it almost doesn’t need to be. Case in point: this week’s final twist, which has the Emperor pretending to be her Mirror Universe counterpart (ie, Captain Phillipa Georgiou), back at the helm of the Discovery for the mission to Qo’noS. There are the vaguest hints of justification for this: the Emperor meets privately with Sarek and tells him that Burnham’s plan won’t be enough, and presumably Sarek brought that information to Cornwell, and then this happens. 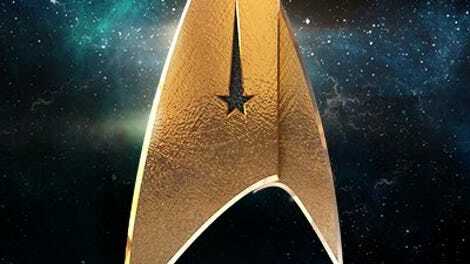 Maybe it’s a way to psyche the Klingons out? (Since this is a secret mission I’m not sure how that works, but sure.) Or maybe there’s some deeper level to the ruse, some information the Emperor has that only she can exploit at the right moment. 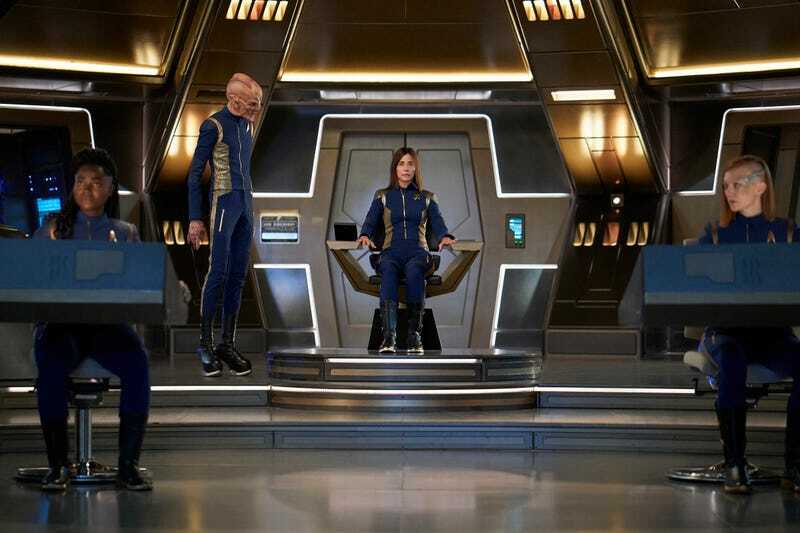 I’m sure we’ll find out next week, and I’ll keep my fingers crossed that it makes sense; for right now, more than anything it just looks like the writers decided it would be cool to get Michelle Yeoh back in the captain’s chair and then worked backward from there. And yes, it is cool. I just keep hoping for more. Detmer gets named twice this week. Maybe she’ll actually have something to do next week! So Sarek just forces mind melds on people now. I still find this weird as hell. I’m also not a huge fan of the way the cold open ends with Sarek dramatically saying “Captain Lorca… is dead.” We know. We saw it happen. This is no longer dramatic for us. It’s really hard to be disturbed by the Klingon war when it still feels like the universe has maybe thirty, forty people in it. Tyler accusing Burnham of breaking off their relationship because she can’t handle being in love with a Klingon is melodramatic and idiotic, and really just serves to underline how nonsensical his character arc is at this point. Yes, Burnham is the one with the problem here. Sure.